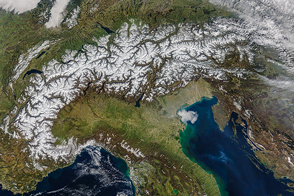 The Alps form a crescent stretching from the Mediterranean coasts of Italy and France to Vienna, Austria. On January 17, 2011, clear skies afforded the Moderate Resolution Imaging Spectroradiometer (MODIS) on NASA’s Terra satellite an uninterrupted view of the mountain range. 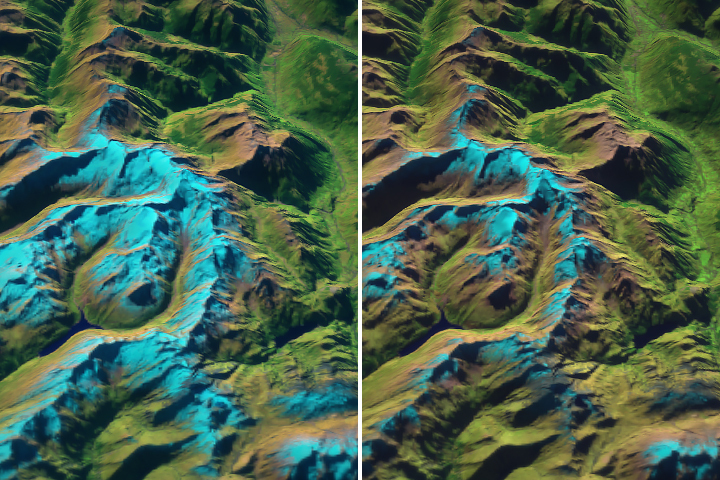 This natural-color image shows snow-capped mountains interspersed with vegetated valleys. 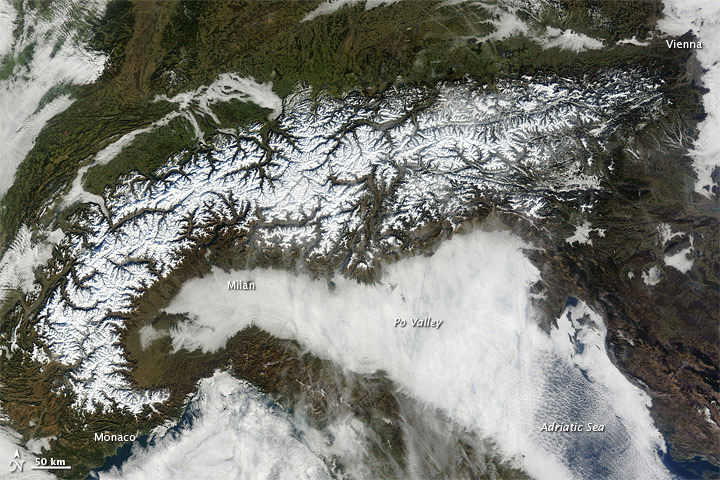 Clouds snake through valleys in the north and west, and a nearly continuous cloud bank fills the Po Valley in the south, but skies over the mountains are clear. The Alps’s began forming tens of millions of years ago, when the African tectonic plate slowly collided with the European plate. The plate collision helped close the western part of the ancient Tethys Sea and lifted up the massive European mountain chain that persists today. Across the Earth, some mountain ranges are gaining elevation through tectonic uplift, while others are losing elevation through erosion. A study published in Tectonophysics in 2009 found that the Alps are doing both. The actions of glaciers and rivers scrape away fine sediment, which is carried away by water and wind. As this happens, the mountain range loses weight, lightening the load for the Earth’s crust. So just as ice and water scrape off the top, deeper rock layers push up from below. In the Alps, these processes appear to be in equilibrium, keeping the mountain range at a near-constant elevation. In the Alps region, the valleys have attracted as much scientific attention as the peaks. Over hundreds of thousands of years, advancing Pleistocene glaciers ground away massive quantities of rock, leaving broad, U-shaped valleys. In between glacial advances, rivers carved deep, V-shaped gorges in many valley floors. Geologists long differed about how the steep, river-carved gorges could persist once the glaciers re-advanced. Many thought each new advance would wipe out the underlying gorge, and that the gorges seen today must have been carved since the last glacial episode ended. But a study published in Nature Geoscience in 2011 argued that many of the steep gorges at the bottoms of the Alps probably persisted through multiple glacial episodes. After mapping more than 1,000 gorges, and calculating the rate at which rivers could have eroded bedrock since the last glacial episode, the researchers concluded that rivers could not work fast enough to carve such deep gorges. The depths of the gorges indicate much older formations. As glaciers re-advanced, the researchers concluded, sediment filled the deep gorges and preserved them below glacial ice. After the glaciers retreated again, fresh rivers cleaned out the sediments and continued carving away at the bedrock. NASA image courtesy Jeff Schmaltz, MODIS Rapid Response Team at NASA GSFC. Caption by Michon Scott. 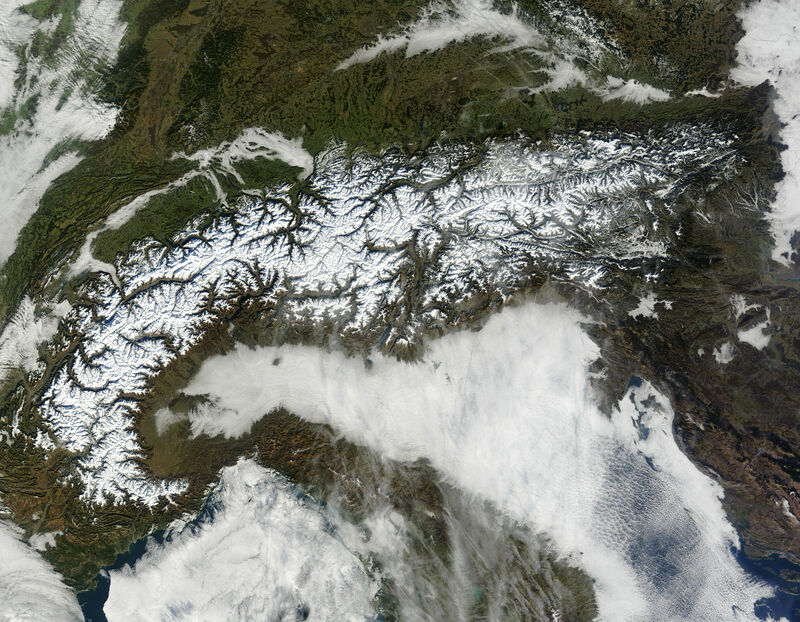 Acquired January 17, 2011, this natural-color image provides an uninterrupted view of the Alps. Champagnac, J.-D., Schlunegger, F., Norton, K., von Blanckenburg, F., Abbühl, L.M., Schwab, M. (2009). 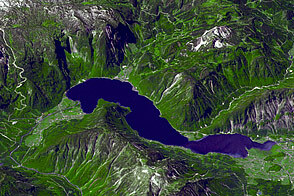 Erosion-driven uplift of the modern Central Alps. Tectonophysics, 474, 236–249. Dixon, J.L. (2011). Deceptively old Alpine gorges. Nature Geoscience, 4, 8–9. Encyclopedia Britannica. (2011). Alps. Accessed January 19, 2011. Lamb, M.P., Fonstad, M.A. (2010). Rapid formation of a modern bedrock canyon by a single flood event. Nature Geoscience, 3, 477–481. Montgomery, D.R., Korup, O. (2011). Preservation of inner gorges through repeated Alpine glaciations. Nature Geoscience, 4, 62–67. Romans, B. (2011, January 8). Rapid canyon formation and uniformitarianism. Clastic Detritus. Accessed January 21, 2011. Science Daily. Science Reference: Geology of the Alps. Accessed January 19, 2011. Science Daily. (2009, November 6). Are the Alps Growing or Shrinking? Accessed January 19, 2011. Stricherz, V. (2010, December 5). New research shows rivers cut deep notches n theAlps’ broad glacial valleys. EurekAlert. Accessed January 21, 2011. Wikipedia. (2011, January 16). Alps. Accessed January 19, 2011.